Des is sitting on the couch, listening to a tape, trying to learn Japanese. Mike emerges from his room and starts teasing Des about it. 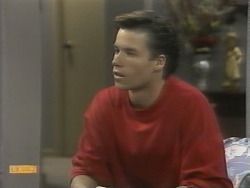 There's suddenly a knock on the front door and Mike answers it to find Kerry on the step. She comes in and tells Des that she stopped by to see how his pots are going. He tells her that they're out the back, drying. Kerry then asks Des why he's learning Japanese. Des explains that he's always been interested in Japan and it's the up-and-coming language, especially in business. MIKE: Yeah – if you can actually understand what they're saying! Kerry suggests that maybe Des is going about it the wrong way: listening to tapes isn't real; he needs to get the feel of it from the ground up. She then asks Des if he'll be home tonight. He nods that he will and asks why. Kerry just smiles that he'll see! HAROLD: Yes, well, let's hope it *doesn't* come to that, eh? Henry is sitting on the lounge room floor of No. 22 amidst some piles of clothes and games. He's playing his guitar. Bronwyn comes in and muses that she hopes he didn't wear himself out chucking all that stuff down the stairs. Henry tells her that he thought he wouldn't pack until *she* got back: she's much better at it than him! Bronwyn rolls her eyes. Henry goes on that all that house-moving gives a bloke an appetite. Bronwyn hands him the tin of biscuits from Liz Anderson, together with an envelope, and tells him that someone left them on the doorstep. Henry smiles that it must be Liz. He bites into a biscuit and exclaims that it's good! Bronwyn then asks what's in the envelope. Henry replies that it must be the cheque. He opens it and finds a letter inside. He muses out loud that he wonders what Liz would be writing to *him* for. He starts reading the letter and a look of shock crosses his face. BRONWYN: I said: is something wrong? HENRY (quickly): No. I think I need some fresh air! With that, Henry dashes outside, leaving Bronwyn with a sly smile on her face! MIKE (coolly): Only after I nearly got the sack. Anyway, this time it's for real: I'm qualified and I'd really like to make teaching my career – so when we're in class, I expect you to call me ‘Mr. Young' and give me the same sort of respect that you do for all the *other* teachers, OK? NICK (laughs): Who says we give *them* respect?! Mike ignores this and goes on that there's something else. He then says to Nick that he knows school hasn't really fired Nick's imagination, but that's not his problem: he expects Nick's homework to be handed in on time, otherwise it'll be an automatic detention. Sharon exclaims indignantly that Mike is already assuming Nick won't *do* it. Mike, however, insists that he's just establishing some ground-rules. NICK (mutters): Anything you say, ‘Mr. Young'. SHARON: I don't know about *you*, but I sure don't feel like partying anymore. NICK: No. No! To hell with him! The ‘Mr. Young' regime doesn't start until tomorrow. Sunday's our day and we'll enjoy it if we want to. Get your book out and start ‘phoning! Mike remarks that he takes it this isn't from Bronwyn. HENRY: This woman happens to be over 70! HENRY: Yes! I do her gardens, right? I try to be friendly with her, like I am with *all* my customers. She must be going senile. Mike muses that it couldn't be *real* love, not for a woman of *that* age. MIKE: No. No... I reckon it's purely physical! With that, Mike hands Henry the note and walks off, leaving Henry looking flabbergasted! Harold arrives home and tells Madge – who's sitting in an armchair, sewing – that he caught Sharon and Nick buying food for a barbecue: they must have invited just about everyone they've ever met in their entire lives. He adds that he might pop over and check on them later; he did promise Hilary. Madge doesn't respond, though, and Harold remarks that she hasn't heard a word he said. He asks what's wrong. MADGE (sighs): I can't help it: I just keep thinking about Fred and all the unhappiness he caused me with his womanising. I couldn't stand it if Charlene had to go through that. MADGE: What if he *doesn't*? HAROLD: Well... then you and I would have to be very strong for Charlene. MADGE: The way *I'm* feeling, you might have to be strong for *both* of us. 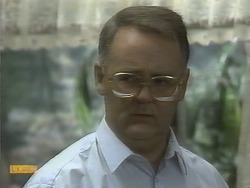 Harold assures Madge that he'll be there for her. BRONWYN: If you think you'll be lonely, you could always go over and see Liz. BRONWYN: Well, you're always going on about how much you like the girl. I guess I'll just have to be broad-minded and trust you not to run off with her! HENRY (quickly): Who said anything about running off?! Look, I think I might stay home tonight, anyway! BRONWYN: Please yourself! There's supposed to be a good movie on, actually. What's it called again? ‘Harold and Mavis'? Something like that. HENRY (warily): ‘Harold and Maud'? BRONWYN: Yeah, yeah, that's the one! It's about this guy who has a fling with a woman old enough to be his granny. It's really good! HENRY: No, I don't think that would appeal to me very much! BRONWYN: Typical! You guys are all the same: reckon a woman isn't worth looking at unless she's young and cute. Personally, I think if two people are right for each other, age shouldn't come into it. You know, if I really liked a guy, it wouldn't matter *how* old he was. Matter of fact, I've been giving that sort of relationship a *lot* of thought, lately. With that, Bronwyn picks up a packed suitcase and heads next door, leaving Henry frowning at the letter in his hand! Jamie, Sky and Kerry are all dressed in Japanese-style clothing provided by Kerry. Des is standing with Kerry and he asks her what's going on. Kerry tells him that the only way to really learn a language is from the ground up, by immersing yourself in the culture. She tells him to take off his shoes, and she holds out a gown which Des slips over his clothes. The two of them then sit down on the floor by the coffee table and Kerry pours Des a glass of sake. He tastes it and starts coughing at the kick it has in it! Kerry then says she'll show Des how to use chopsticks. Des insists that there's nothing to it! He takes the chopsticks just as someone knocks on the front door. Kerry goes to answer it and finds Bronwyn on the step. She heads inside and, looking at the outfits and the food and drink laid out, asks what's going on! KERRY: Orient night in Ramsay Street! DES: Kerry's got the idea that if I understand the Japanese culture, I'll be able pick up the language easier. KERRY: Do people *often* stop by to borrow your son?! The barbecue is underway and Sharon and Nick are telling a couple of their mates about how Mike has already been round to see them and told them that they have to call him ‘Mr. Young'. One kid remarks tersely that school hasn't even started yet and he's already laying down the law. NICK: Yeah, well *I* reckon it's about time somebody took him down a peg or two. BRONWYN: I almost wish you *were* hiding something from me. It would make what I've got to tell you a whole lot easier. BRONWYN: I just want you to know I didn't plan it or anything; I don't know – it just happened somehow. HENRY (warily): Do you want to let me in on your little secret? 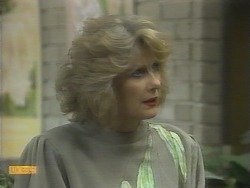 BRONWYN: You remember I mentioned earlier that if two people really like each other, age doesn't make any difference? 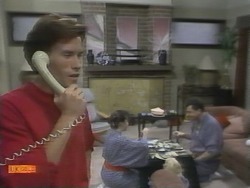 BRONWYN: Well, it wasn't just talk: I've been seeing somebody lately – a guy who's in a totally different age-group to me. HENRY (looking horrified): A *guy*? A different--; you've been seeing--? Who is he? Do I know him? A teacher at Tech? HENRY: Do I want you to tell me who he is? BRONWYN: Probably not – but I've got to come clean. I brought him over to face the music. HENRY: Hang on a minute... that letter from Liz: you knew about her all the time! BRONWYN: Not *all* the time: I found out today when she came round to drop your cheque off! BRONWYN: You've had me running around waiting on you hand and foot; it's about time *somebody* taught you a lesson – and I've only just started...! 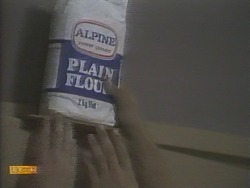 NICK: Not water – *flour*! Everyone bursts out laughing as Nick enthuses that Mike's going to find it hard to play the tough guy when he looks like the Abominable Snowman! BRONWYN: The Clarke son and heir duly returned. Thanks, Des! Des smiles that they're just in time to join them. Bronwyn, however, explains that Henry's taking her out and she's allowed to order *anything*! DES (grins): And he *admitted* it?! Harold is standing on the driveway of No. 24, looking at his watch impatiently. Madge emerges from the house eventually and Harold asks wearily how long it takes to change one dress. Madge points out that the social doesn't start for another half hour, but Harold tells her that he thought they might just casually drop in on No. 30. Madge sighs that she wishes he'd leave well enough alone. Harold, however, reminds her that he promised Hilary. MADGE: If I know *you*, you'll get on your high-horse and you're going to ruin the evening completely. HAROLD: Madge, that is hardly fair: you *know* I promised to be more tolerant with young people. Don't worry – I'll be diplomatic. MADGE: I'm not sure whether your definition of that word and mine are the same! Madge then grabs Harold's arm and they head down the driveway, Madge sighing that Harold's got to let her do the talking. NICK: Come in, it's open!